"Improve Your Card-Play at Contract or Auction Bridge" by Madeleine Kerwin explains 'the simple principles of correct play in a nutshell and how to make the most of your hand'. Published in 1931, this is a collector's item. "The 'Country Life' Book of Bridge Play Technique" by Pat Cotter and Derek Rimington. Meet the obligatory finesse, the Vienna coup, Morton's fork and numerous other invaluable techniques in this essential guide to good bridge play. "BRIDGE: The Complete Guide to Defensive Play" by Frank Stewart and Derek Rimington. Concentrating on defensive play in bridge, this book covers all aspects of play from opening leads, second, third and fourth-hand play, timing, signalling, cutting communications and counting to inferential and deceptive play. "Mendelson's Guide to the Bidding Battle" by Paul Mendelson. For social, club and tournament bridge players alike, the author's explanations and the way he demonstrates his strategies are aimed at those who have mastered basic bridge play and who have a zest to win. "Advanced Play at Bridge" by Hugh Kelsey. As the title implies, this is not a book for beginners, but is intended for those who are prepared to think hard and logically about the problems the author has assembled. The author's other books include "Bridge for the Connoisseur". "Bridge Player's Companion (Pocket Size Companion)" by Ronnie Sellers. This pocket-sized hardcover journal is designed for the game of Bridge enthusiast. It has 180 lined pages divided by 6 colorful, subject-specific tabs; Games, Players, Scores, Web Sites, Strategies and Resources. Each companion also features a nameplate and clear, zippered pocket for easy storage of related items. 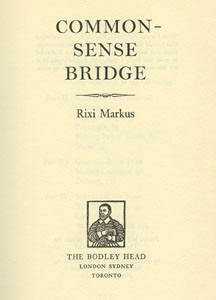 "Commonsense Bridge by Rixi Markus. No elaborate rules, no artificial conventions, only the pleasure and profit of playing the game. 'Her writing stylr is like her play - always agressive, but colorful and well conceived' - Howard Schenken. "The Rixi Marcus Book of Bridge" by Rixi Markus, the world's number one woman bridge player for four decades (30's to 70's). Rixi was the bridge correspondent of UK's The Guardian newspaper for many years and after 1975 the London Evening Standard, and wrote a dozen bridge books. "Play Bridge With Zia" by Zia Mahmood and Jonathan Rice. The principle of the auction is not unique to bridge, but it is what separates bridge from most other card games. This book is aimed at people who are deterred from learning to play, as it all seems too complicated. The world-class player Zia Mahmood explains that, if you can bid for a piece of china at an auction, by learning the language you can learn to bid for a contract in a bridge auction. The book lays out in straightforward steps the rules, conventions and peculiarities of bridge, with examples of the best and worst ways to play a hand. The game of bridge, introduced to Ireland as a drawing room pastime at the end of the 19th century, subsequently developed to become an international sport. Bridge clubs appeared during the 1920s, and in 1932 it became a nationally organised competitive game. Politics caused a rift in the 1950s and the Northern Ireland troubles of the 1970s cast their own shadows. Political figures have historically been involved with bridge, including participants in the 1916 Rising, such as Roddy Connolly, son of James Connolly. "Thank You, Partner: A History of Bridge in Ireland " by Seamus Dowling is the first Irish Bridge book and the product of ten years research brings the reader up to March 2009. Official records and print have been trawled to trace the origins of the game, the changes which it underwent and the external influences which inspired the pioneers of the modern Irish game. Initially an activity for middle class professionals with a Protestant majority, following the conflicts of the early 1920s it was embraced by the wider population and became a unifying force. This book is a fascinating read for bridge aficionados and also those interested in social history. "Improving Your judgment 1 : Opening the Bidding (The Official Better Bridge Series)" by Audrey Grant. The first bid in a bridge auction impacts the bidding, play and defense of the entire deal. There's more to valuing a hand than adding up the high-card and length points. This book shares tips to improve your judgement and help you make better decisions when you are in a position to open. It includes the Guidelines of 15 and 20, light opening bids, pre-emptive bids and strong 2 Clubs, and more. "Improving Your judgment 2 : Doubles (The Official Better Bridge Series)" by Audrey Grant. Understanding the many uses of doubles can dramatically improve your game. Includes Takeout double, responding to the takeout double, rebids, balancing and other doubles. "The Joy of Bridge"and "The Joy of Bridge Companion". In the companion volume, Life Master Audrey Grant and World Champion Eric Rodwell have again joined forces to create the perfect complement to their national best seller. The exercises and activities in both of these books will provide hours of entertainment, as well as improving the game of both beginners and experienced players. "Fits and Mis-fits" by Rhoda Barrow Lederer covers fits and misfits in all their aspects: how to recognize them; when to stretch the bidding; when to hang back; the need to bid your values once only; how to find fits on one-, two- and three-suiters in contested and uncontested sequences; doubling and redoubling situations; how to counter the opponents' transfer bids and other artificial gadgets; warning signs of misfits; when and when not to rescue; how to get the most out of your opponents' misfits and, finally, defensive strategy against these difficult hands. The book aims to be simply and clearly written with no complex gimmicks. Much of the text is concerned with hands that have been dealt (and caused problems) in competitions. Rhoda Lederer holds the English Bridge Union's Honorary Teaching Diploma and was Executive Secretary of the EBU's Teachers' Association and one of the examiners for those seeking a teaching diploma. David Griffiths holds a Gold Level Diploma. "Card play Technique: Contract Bridge" by Norman Squire. The author, international champion and repeatedly winner of major British championships, is as lucid on play as he is known to be on bidding. In this book (not to be confused by the book with the same title by Victor Mollo and Nico Gardener) he takes the reader through all the stages needed to achieve the righr result - from the initial lead to the most advanced pinning squeeze. 'Answers are easy' says Norman Squire, 'what the average player needs to knowis which questions he should ask himself. In analysis after analysis Squire teaches just this. "Bidding at Bridge" by Norman Squire. The author, by his previous writings and his many original oand pioneering expositions, has done a tremendous amount to improve bidding standards. In this book, a panorama of natural bidding, he stresses the need for complete systemic integration and gives alternatives; showing what is good and what is better (and why), but leaves the choice to the reader.